Doctor Octopus learned our hero’s secret identity while the webslinger slugged it out with Stunner in AMAZING SPIDER-MAN #397, but later Ock attempted a cure for a deadly virus plaguing Spidey in SPECTACULAR SPIDER-MAN #220. Battle broke out between the two in AMAZING SPIDER-MAN #398, and the mysterious Kaine lurked on the sidelines while Octopus and Spider-Man concluded their battering business in SPECTACULAR SPIDER-MAN #221. Peter Parker’s clone, Ben Reilly, carved out some crunch time with the Grim Hunter in WEB OF SPIDER-MAN #120 and SPIDER-MAN #54, but Kaine and the Jackal insisted on their own appointment with the Scarlet Spider in WEB OF SPIDER-MAN #121. In the aftermath, the Hunter lost his life in SPIDER-MAN #55, and Ben took on Terror Unlimited in SPIDER-MAN UNLIMITED #8. Peter and Ben put aside their differences to team up against the Jackal in WEB OF SPIDER-MAN #122, while the villain renewed his lust for life in AMAZING SPIDER-MAN #399 and manipulated his mind games on the heroes with a clone of the late Gwen Stacy in SPIDER-MAN #56. 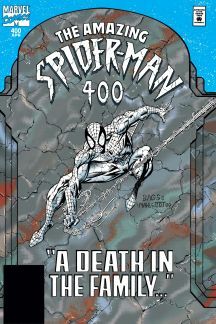 A third Parker clone entered stage left in SPECTACULAR SPIDER-MAN #222, both Ben and Peter learned the supposed “truth” about their own existence in WEB OF SPIDER-MAN #123, and the ultimate unthinkable, the death of our beloved Aunt May, occurred in AMAZING SPIDER-MAN #400. 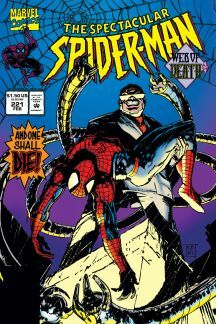 Despite the pall fallen over Peter’s life, Kaine continued to stir the pot in SPIDER-MAN #57, and the Jackal escaped prison while at the same time Peter found himself incarcerated in SPECTACULAR SPIDER-MAN #223. Accused of murder in WEB OF SPIDER-MAN #124, the wallcrawler felt the mark of Kaine upon him in AMAZING SPIDER-MAN #401, and Mary Jane encountered a threat of her own in SPIDER-MAN #58. Ben swapped places with Peter behind bars in SPECTACULAR SPIDER-MAN #224, and the third Parker clone transformed into a monster called Spidercide. The Sinister Seven declared war on Kaine in SPIDER-MAN UNLIMITED #9. The Traveler vied for Aunt May’s soul in AMAZING SPIDER-MAN #402, and Ben took the fight directly to him and Scrier in SPIDER-MAN #59. Peter encountered the Gwen clone in WEB OF SPIDER-MAN #125, and witnessed the rise of a strange, new Green Goblin in SPECTACULAR SPIDER-MAN #225. Ben, posing as Peter, faced a murder trial in WEB OF SPIDER-MAN #126, while the Traveler began to conduct a trial of his own against Spidey in AMAZING SPIDER-MAN #403. Kaine stood revealed as another clone of Peter in SPIDER-MAN #60, and Ben trial concluded with a big battle in SPECTACULAR SPIDER-MAN #226. Spidercide reared his ugly head in SPIDER-MAN: MAXIMUM CLONAGE ALPHA, the Punisher shot the Jackal in WEB OF SPIDER-MAN #127, only to see him healed in AMAZING SPIDER-MAN #404 and tormenting Kaine and Ben. 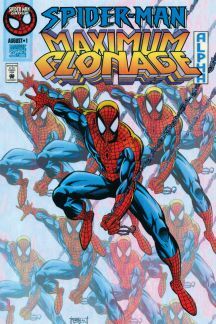 The Scarlet Spider faced down an entire army of Spider-Clones in SPIDER-MAN #61, joined with Spidey to clash with Kaine in SPECTACULAR SPIDER-MAN #227, and observed the deaths of both the Jackal and Spidercide in SPIDER-MAN: MAXIMUM CLONAGE OMEGA. The question of the right to continue as Spider-Man plagued both Peter and Ben in WEB OF SPIDER-MAN #128, prompting Ben to leave town in AMAZING SPIDER-MAN #405 only to be captured by the new Doctor Octopus when he decided to return. The Vulture flapped his wings for attention in SPIDER-MAN #62, so Ben clipped said wings in SPIDER-MAN UNLIMITED #10. The Jackal’s hypnotic suggestion for Peter to kill Mary Jane flared up in full flame in SPECTACULAR SPIDER-MAN #228, and later he joined forces with the Scarlet Spider and the New Warriors in WEB OF SPIDER-MAN #129. It proved to be one of Peter’s last missions as Spidey (for the time being), because after the new Doctor Octopus’ virtual reality debacle in AMAZING SPIDER-MAN #406, and the two heroes’ takedown of the villain in SPIDER-MAN #63, Ben Reilly too over as the one, the only Spider-Man in SPECTACULAR SPIDER-MAN #229.